We want residents to be proud of where they live, and be active in their local community. When people come together they build lasting relationships, celebrate their community and have fun. The Inclusive Neighbourhoods Grant will support local people to put on an event or deliver a project that brings people together, is organised by residents, improves a local asset such as a park, or showcases community strengths. £20,000 will be released every two months. Closing dates for each period will be: 31 January, 31 March, 31 May, 30 July, 30 September and 30 November. The grants will be awarded by a cross-party panel of Councillors from across the borough. 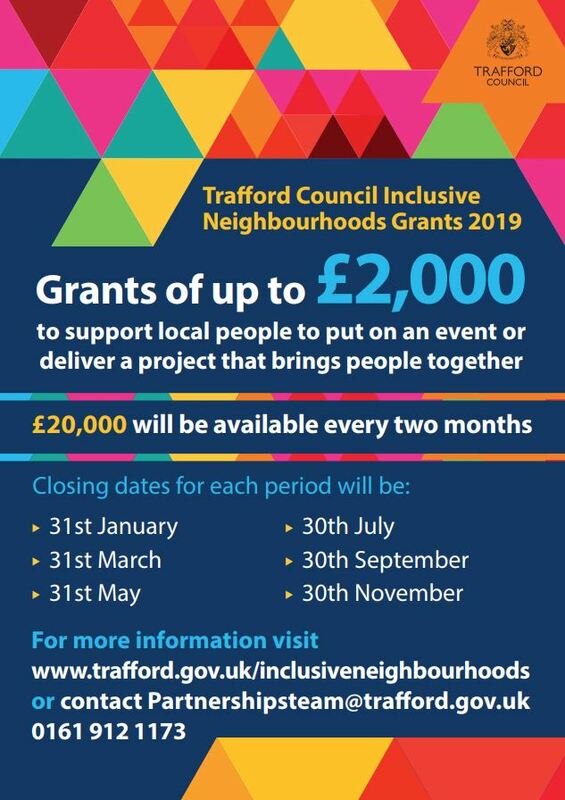 To apply for a grant of up to £500 to support an event download the Inclusive-Neighbourhoods-Grant-Application-Form-2019-events and Inclusive-Neighbourhoods-Grant-Events-Guidance-Notes-2019. To apply for a grant of up to £2,000 to support a project download the Inclusive-Neighbourhoods-Grant-Application-Form-2019-projects and Inclusive-Neighbourhoods-Grant-Projects-Guidance-Notes-20. For further information visit www.trafford.gov.uk/inclusiveneighbourhoods or contact us at partnershipsteam@trafford.gov.uk or by telephone 0161 912 1173. Thrive Trafford delivered by Pulse Regeneration working in partnership to provide Trafford Council's Third Sector Infrastructure Development and Support Service.